A Toronto-area teachers union has launched a campaign seeking more classroom support for special needs students after members say they've witnessed an increase in violent incidents and the need for teachers to wear protective gear. "We're rolling out this campaign because of the dramatic increase in calls we've received and concerns that we've heard from members over the increase they've experienced of violence in their classroom," said David Mastin, president of the Elementary Teachers' Federation of Ontario Durham Teacher Local. The campaign is called "Safe Schools for All" and involves public education through social media, mainstream media and regular community forums in the Durham region. "We felt that it was imperative for the public to be aware as to what's actually going on, not from a position or perspective that they need to be afraid, or need to be concerned, but that there are supports that are lacking." Mastin says the union carried out a survey last November in which an "astounding" number of members reported a variety of different types of interactions with violent incidents involving students. The survey of more than 2,700 members of which 791 responded indicated that there were more than 300 incidents of violence in 2016. "The bites and the scratches and the kicks and the punches — those have all happened on numerous occasions," said Mastin. "The worst example is one of our members had their head smashed against a desk by a student. They were off for a number of weeks, not just to recover physically but also psychologically." In order to help teachers protect themselves, the Durham District School Board (DDSB) provides teachers with protective gear like jackets with Kevlar-like inserts. The gear includes arm and leg guards. The "hoodie" includes an arm- and head-covering. In most cases, teachers are required to wear it while for others it is optional. Mastin says six per cent of those who responded to ETFO Durham's survey said they were required to wear the gear. 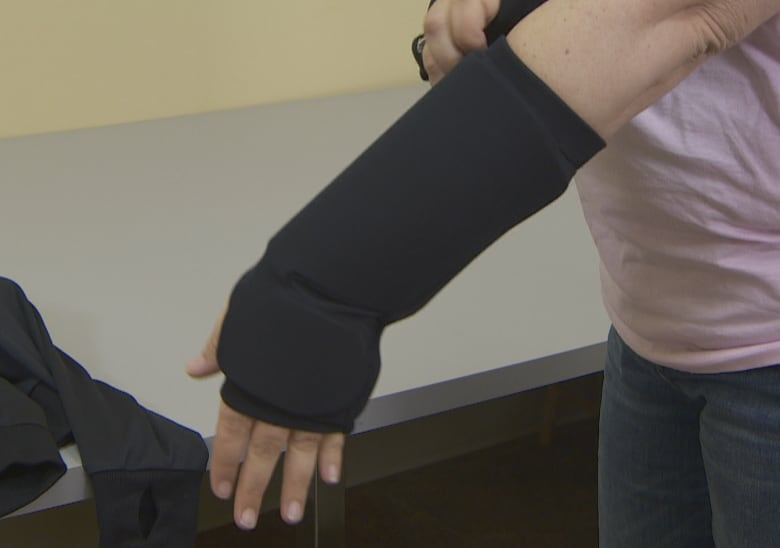 A teacher who has been with DDSB for more than a decade says the gear is the difference "between a bruise and a broken bone or a bruise and cutting into the skin." The teacher, who didn't want her identity revealed because she's concerned it may affect her employment status, told CBC Toronto that a lot of the violence she sees in her classroom has to do with various special needs that students have. "It's not personal at all," she said. "I think that's hard for a lot of people to wrap their head around. [Special needs students] are struggling with their own needs and issues, and we just happen to be there." She added that she has colleagues who wear the protective equipment daily, and that while it helps protect them, it can get uncomfortably hot, especially as many teachers are moving around while wearing it. Mastin said the school system encourages integrated learning with special needs students so that mainstream classrooms are accessible to as many students as possible but that teachers, educational assistants and early childhood educators have called for more support in the classrooms. The union wants to see the provincial government review its funding formula and allocate more bodies and resources to special needs programs. Terry Simzer, communications manager with DDSB, says the issue is province-wide and not unique to Durham. "That is something that happens across the province. It's a concern we share," he said. "All of us want the best education opportunities for students with special needs." In a statement sent to CBC Toronto, the Ontario Ministry of Education said that it plans to allocate $219 million in this coming year toward hiring additional teachers, education workers to "support special education and other staffing priorities." Of this funding, the ministry says, Durham is projected to receive more than $7 million for 2017-18, which could support an estimated 25 teachers and 51 education workers. Expanding access to information so it is easier for teachers and education workers in the province to have the information necessary "to protect themselves and maintain a safe and inclusive classroom." Enhancing the role the Ministry of Labour plays when it comes to complying with the Occupational Health and Safety Act (OHSA) requirements in the school setting. Making the incident-reporting process easier to "ensure that school staff are never discouraged from reporting, and allow for the collection of more accurate data that will help us all to better understand and address this serious issue."